Rev. Moon Sun-myung, the founder of the Unification Church and a business mogul, died shortly before 2 a.m. on Monday morning. He was 92. Moon died at a church-owned hospital in Gapyeong, Gyeonggi Province. His wife, Han Hak-ja, and children were at his side, the church said. Moon was admitted to the intensive care unit at Catholic University St. Mary’s Hospital in Seoul on Aug. 13 with complications of pneumonia. Last Friday, as the doctors described his condition as “irreversible,” Moon was transferred to CheongShim International Medical Center in Gapyeong on Friday. Moon’s funeral is scheduled to take place on Sept. 15 at CheongShim Peace World Center, an indoor arena that can accommodate up to 25,000 people, also in Gapyeong. He will be put to rest at a mountainside grave in the same city. Gapyeong is considered the holy place of the Unification Church. Moon Hyung-jin, the youngest son of the church founder and the Unification Church international president, will preside over funeral committees around the world, the organization said in a press statement. Moon’s wake will be open to the followers and the general public for eight days, from Sept. 6-13. Born in Jeongju, North Pyeongyang Province in today’s North Korea, on March 6, 1920, Moon founded the Unification Church in 1954. Today, the controversial church has mission centers in 194 countries and is said to have 3 million followers around the world. In Korea, it claims a membership of some 200,000 and about 200 churches. Moon was a business mogul with a vast business empire stretching from Korea to the United States, where he lived for some 30 years. Ilwha, Yongpyeong Resort and the Segye Times are some of his business interests in Korea. In the United States, the Unification Church is associated with the Washington Times, United Press International and the New Yorker Hotel, a New York landmark. In 1991, Moon visited North Korea and met with then North Korean leader Kim Il-sung. The Unification Church runs Pyeonghwa Motors, an automobile plant in North Korea, in a joint venture. The Unification Church is also engaged in various educational and cultural activities, such as the Sunhwa Arts School, Sunhwa Arts High School, CheongShim International Academy, Cheongsim International High School and Sun Moon University. The Little Angels, a performance troupe of young girls, and the Universal Ballet Company are also associated with the Unification Church. In 2008, Moon Hyung-jin succeeded his father as the leader of the Unification Church. The fourth son of the founder, Moon Kook-jin, holds the title of Tongil Group chairman and oversees the business concerns of the church. 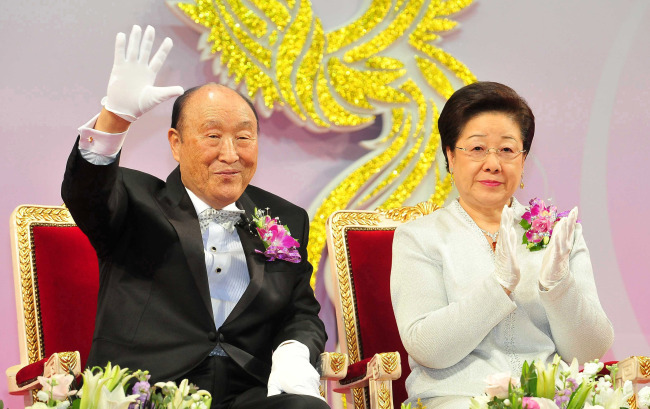 It is reported that the trio of the two sons and Han Hak-ja, who acted as co-chairwoman of the church alongside her husband, will lead the Unification Church.